My husband and I got Hank August 28th, 2010 and he's been a great addition to our family. Neither of us have ever had a dog before. So, having Hank around is a different adventure every day. He loves to play, learn new tricks, go on walks and he has a fascination with our ears. Hank will sit and shake for a fresh carrot any day of the week! He can't get enough fo them. We are taking Hank to Puppy Kindergarten for our sanity.. he likes to play bite a little too much. Hank is one lovable, loyal dog. He is our shadow.. even if he's sleeping, he has to get up and follow us wherever we are going. This picture was taken when Hankie was 2 months old. We got him from a family who breeds Jacks. We fell in love with him as soon as we saw his picture. We had to have the little guy! I am so glad that HANK found you all! 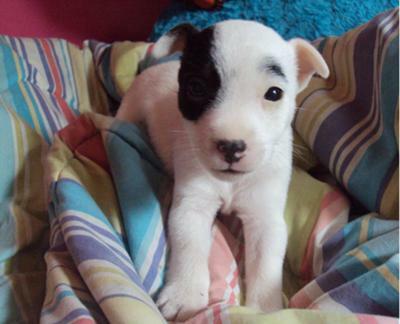 What a wonderful and inspiring story of one of our JRT's. He is a keeper and blessed to have you. Thank you for seeing how important it is to train and socialize Hank.